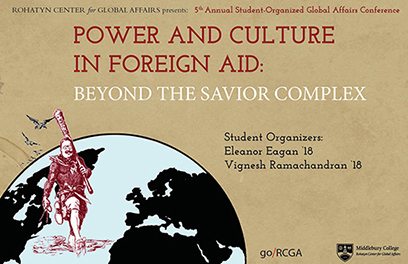 "Power and Culture in Foreign Aid: Beyond the Savior Complex"
This year's conference will examine how cultural hegemony has allowed powerful states to construct a language of universalism that perpetuates old systems of power and influence under the guise of pursuit of the common good. In Prison Notebooks, Antonio Gramsci theorized cultural hegemony at the state level, but his conception of hegemony has applications for the study of international relations. Powerful states expand their domestic hegemony outwards into the international arena using international organizations to facilitate expansion, legitimize their power, and absorb counter-hegemonies. In this conception, the construction of hegemony relies not only on violent force and economic dominance, but on a process by which the powerful change the way the dominated think. The hegemony of ideology is dangerous in that it operates undetected; the hegemon’s interests are made to be neutral. This conference aims to open conversations about how neutral discourse is anything but, bringing attention to the ways in which it validates some ideas and marginalizes others, which in turn encodes superiority and inferiority. This process is especially evident in the international aid industry. The speakers have all produced work that in some way challenges the myth of neutrality in the realm of human rights discourse, development and humanitarian aid. They take up such questions as: Is there a universal language of human rights? Are international institutions ever neutral? How much good does aid do? How does it perpetuate perceptions of superiority and inferiority? "Power and Culture in the Global Polio Eradication Initiative"
"English for the Global: Discourses in English Language Voluntourism"
"Schooling the World: The White Man's Last Burden"
"Aid in Reverse: How Poor Countries Develop Rich Countries"
"Good Neighbors and Lost Cities: Tourism, the Good Neighbor Policy, and the Transformation of the Machu Picchu"